Question - Hello there, I was wondering if it is possible to test rocks to see if they are from space? I ask because, and this is true! Whilst I was gardening today a rock fell into my wheel barrow. It sounds crazy, but it did happen. The object is black, looks like coal, and is very light, I suppose like pumice. If It didn't fall from the sky, I would say it was a piece of normal earth rock, but as it came from above I'm very curious. Carolin - What did they say in response? Graihagh - The response was something along the lines of - I doubt it very much because they're normally very heavy and that sort of thing. But it just tickles me. I read it and it tickled me to no end that these things were falling, and in these people's wheelbarrows or, you know, the idea of it falling in someone's wheelbarrow. Carolin - A couple of years ago there was a lovely story of a French family who, as in the way of the French having their holidays, vacated their house in Paris, went off for their summer holiday and when they came they thought that's strange, our roof is leaking and they sent someone up to fix the roof. And what they found was the hole in the roof was created by a little meteorite that had just punched a hole through the tile and got embedded in their insulation in the roof. So they had their own little meteorite that had hit their roof - I think that's quite cool! Graihagh - Yes, really cool, really cool! I imagine lots of people have got lots of interesting stories about how they've come into... 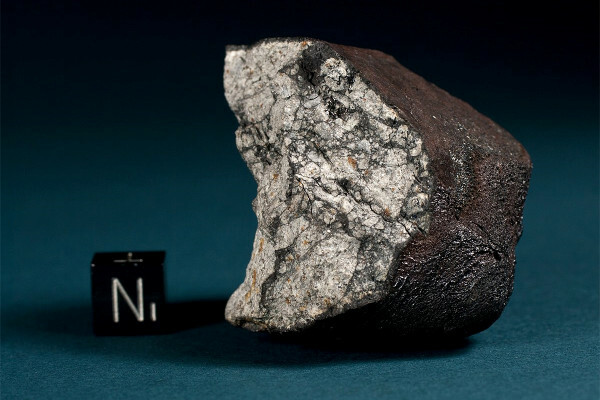 I mean I was really excited about ours but I suppose it's not the most exciting way to come across a meteorite? Carolin - No. The most exciting thing is when you actually the event. You see the fireball and a fireball is just when you've got a bigger lump of rock that, as it disintegrates, it produces a lot more light and often they would just break into lots of pieces and you'd just get a fantastic show as they fall to Earth. Sometimes, if you're fortunate enough to see one of these, especially nowadays with security cameras and you get all these serendipitous sightings of the fireball, you can track it's orbit, you can track its path through the atmosphere, you can predict where it's going to land, and then people can go out and look for the bits of rock. So, for example, this has been done in places like Canada where, across the country, people saw this fantastic fireball in the sky. And then, when it had landed, they tracked it down to where it had landed, they went out to look for it and, it being Canada, it's a land of lakes. All the lakes are frozen and you just looked at the lakes and there were just fragments of meteorites scattered all over the ice on these lakes. I mean that must be so exciting to see those. Graihagh - I was going to ask, because you'd mentioned we're in the peak of this meteorite shower at the moment, is there any chance if I looked really, really hard that I might find one in the UK? Carolin - I think it would be very, very long shot. No I don't think you've got much chance and you've got to remember that for this particular meteor shower Perseids the grains that are coming in they're tiny - they're not going to survive to Earth. You need a much more sizeable lump of rock to be able to get any fragments from it landing on Earth. Next What does a comet smell like? How do we know meteorites have landed on Earth from Mars?